Our rabbit didn’t do too well with her first litter back in March. Gabrielle had the very unpleasant experience of discovering mum in the process of eating, or at least biting into one of her tiny charges and was forced into rescuing it from maternal fangs and then putting it swiftly out of its misery. Horrible. Several died until one day I found the remains of the litter all cold. We did some research and it appears that ironically, considering their immense capacity to procreate, rabbits can be very poor mothers. It also seems that a mother rabbit eating her offspring is not fully understood and isn’t linked to babies being handled (a common claim). The advice seemed to be to forgive her this once, and maybe even a second litter, to see if she’d come good. We took her to the buck again, round neighbour Annick’s house and, three weeks later, she presented us with a litter of eleven. Over the next few days, we lost three and I wondered where we were going this time around but then we started to see signs that the remaining baby bunnies were putting on weight. Except one. Once they had fur and were big enough to scamper round the nest box, we noticed one little scrap was half the size and had his head held to one side and an eye closed. He didn’t seem at all stable when moving around. Then, one morning when I went out to feed mum, I found him outside in the run, soaking wet (it had rained overnight) cold to the touch and barely breathing. When keeping animals, one sometimes has to intervene, as Gabrielle had done above, and perhaps it would have been kind to put this rabbity runt out of his misery. What I did was pick him up and race back to the house, where Gabrielle took him into the bathroom and warmed him up gently with the fan heater but he refused her attempts to feed him. Once he was warm and dry, we tucked him up with the rest of the litter. There was little else we could do and I was convinced that I’d find him dead the following day. He has remained very much alive! We treated his eye with drops and he has grown a lot, almost catching up with the others. Unfortunately for my reportage, in moments of stress, I tend towards an ambulance man rather than a Don McCullin so I don’t have photos of the rescue from hypothermia but you can see how well he looks now in the photo above. 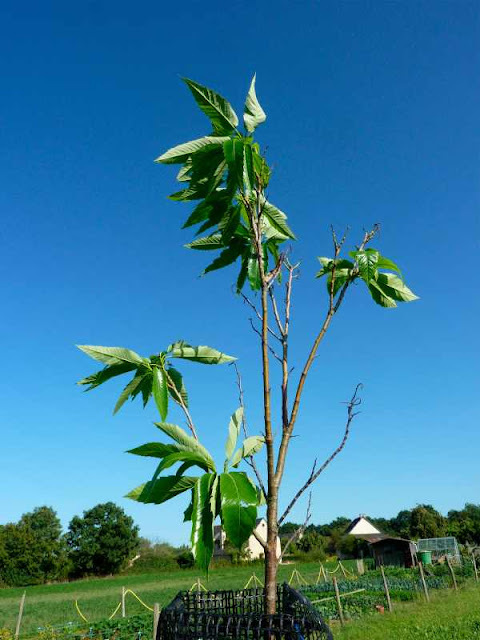 Back in March, with the tree layer of our forest garden finally planned, we had to move a couple of trees including one sweet chestnut (variety: Marron de Redon). A bit late to be mucking tree roots about and getting a bit to big to move anyway, we would need to keep its roots well watered. We had not a drop of rain in April. After a fortnight of parsimonious precipitation, we had another thirty days sans une goutte de pluie. I managed to keep it, the other newly planted trees and the sixty five hedging plants going with too many trips carrying heavy watering cans. 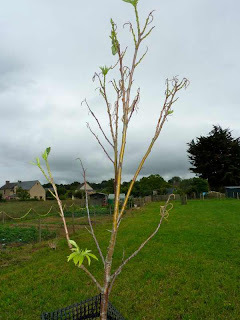 When all seemed to be ticking over nicely, I turned my attention to other things and I found one day that all the leaves had dried up, turned brown and were just about to fall off. I told Gabrielle and tried to be philosophical but it was still very disappointing. I gave it a real soak and left it, not really thinking that there was any way back. The tree wasn’t dead but had gone into self-preservation mode. Large leaves like those of the sweet chestnut transpire a lot of water and as the roots weren’t taking any up, the plant shut down. With a big boost of water, it’s woken up again and is enthusiastically chucking out new, bright green leaves. I won’t let it down again and will keep a close eye on its progress as I’m not sure I’d get a second chance. 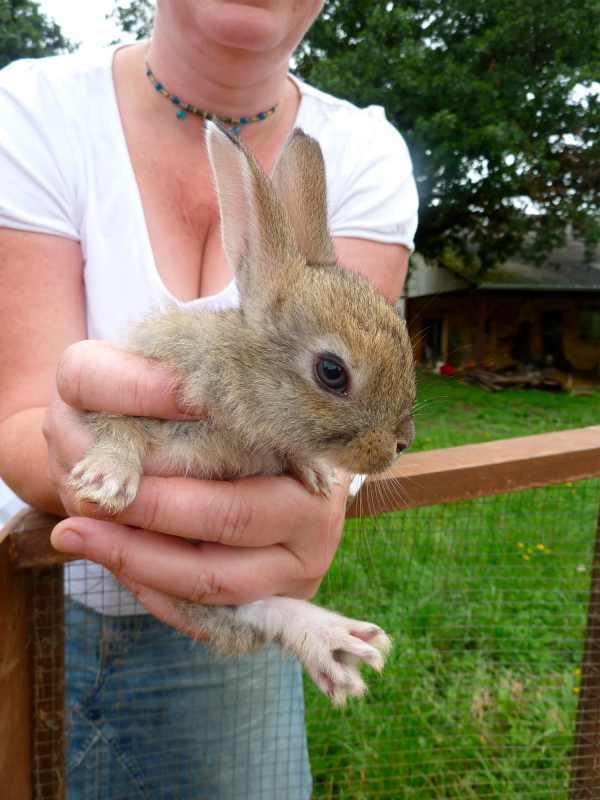 We eventually gave up with our rabbits as we lost so many babies due to bad mothering. I hope yours will do well. You will read in my next blog (10th Sept) that we have just had another bunny emergency. It does seem, speaking to others, that they can be difficult to raise and easy to lose but I'm happy to report that all are back in bouncing good health. Overall, we've done well with a sngle breeding rabbit with occasional visits to a neighbour's buck, and they are delightful creatures, so we are happy to carry on.